Ouch. That stings a bit. It’s a little unfortunate for us that these events happened at the same time. Sure, this Tweet is one-sided, and at least a little unfair. But it should also be convicting. In the grand scheme of things, we spent a day arguing about chicken while the world watched as unbelievable technology landed on Mars. I’ll admit outright that I’ve never been all that intrigued by astronomy. I never wanted to be an astronaut, I’m not all that into sci-fi… and along those same lines, science classes were always my least favorite, and my lowest grades. And this has always come as a surprise to people, considering my last name. From kindergarten to college, people managed to make the connection that I share a last name with the exuberant and brilliant Bill Nye the Science Guy. Funny enough, everyone always thought they were the first person to make that connection. I do enjoy Bill. I refer to him affectionately as Uncle Bill, even though there is no relation. 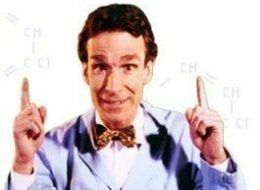 From his quirky show on PBS to seeing him as a meteorological expert on CNN during the storms in Japan, Bill always had a knack for making science relatable and accessible, all while rocking an amazing bowtie. A video surfaced within the last couple days where good ol’ Uncle Bill seems to have an agenda. In the video, Bill Nye addresses the age old debate of creationism vs evolution in a way that left many less-than-thrilled. Again, harsh! Uncle Bill seems to have an axe to grind! Now I’m probably going to get in trouble here… but I think Bill Nye is right. But… I also think he’s wrong. Let’s see if we can parse this out. To help explain how I think Bill Nye is right, let’s take a walk down history lane. There once was a man named Copernicus. Copernicus made an incredible discovery: contrary to popular belief, the earth is not the center of the universe, but rather, all planets in the solar system revolve around the sun. This was an amazing scientific discovery, as it helped explain previously-unexplainable phenomena, and it allowed many more discoveries and theories to be made about the world around us. This view was unpopular, however, with the Church, because it contradicted a particular understanding of some scriptures. Psalm 93, and some portions of Job, suggest that the earth is stationary and unmoving, and that the sun and moon rise and fall. Therefore, any “science” that said differently must be heresy. Copernicus’ ideas were banned, and defenders like Galileo stood trial for attempting to persuade the Church that they were misguided. It wasn’t until much later that the Church’s official stance regarding this changed. Obviously, the integrity of scripture was maintained because it is clear that the writers of Job and the Psalms were not doing science. The Psalms are songs and poems, and Job is something of a drama. Neither wish to tell the reader in a scientific manner the positioning and arrangement of our solar system. With a more proper reading of the scriptures, it was possible to be both a Copernican and a Christian. I am convinced that it is similarly possible, and necessary, to believe in evolution and creation, or evolutionary creation. Genesis 1-2, if read in the original Hebrew (or even English), do not read like a data sheet or a science textbook. It reads as poetry. There is rhythm, repetition, structure, word-play, and flow to it. The importance of the creation story is not about the specific details of how it happened. The story is written to make theological claims about the origin of humanity. 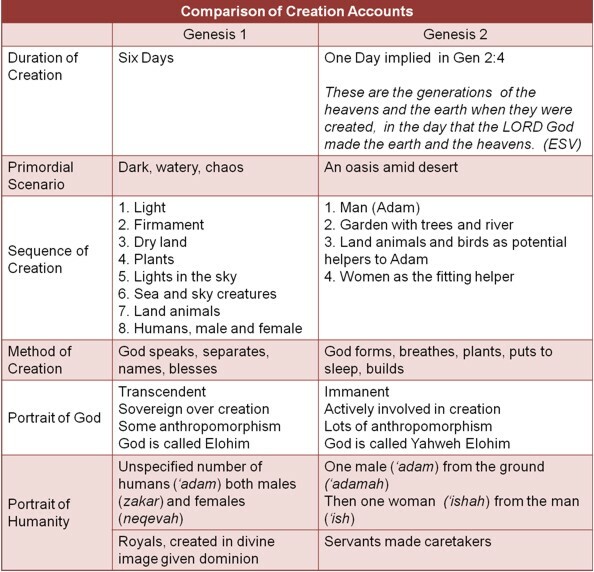 The great thing about this chart is that not only does it show the discrepancies between the stories, but it also leads you to some conclusions about why we have different versions, and why most biblical scholars believe multiple sources and traditions make up our Old Testament. Notice how the second story uses Yahweh, a name not given until later, and God seems more actively involved. These two stories show us multiple attributes of God and how God relates to humanity, in both sovereignty and activity. As I’ve already said, I’m not much of a scientist, but I have seen no evidence, anywhere, of evolution being untrue or of the universe being only 10,000 years old, EXCEPT from those who defend a literalist interpretation of Genesis. And personally, I think that in 250 years we will look back and laugh at how long we defended that, just like we do with the controversy over Copernicus. As Bill says in the video, we’re the only country that still resists evolution as truth, and our universe and all the amazing scientific advancements of the last 100 years don’t make sense without evolution. Now… here’s where I think Bill Nye is wrong. Bill goes on to conclude that we need to stop teaching our kids creationism, because we need a generation of scientific thinkers and voters to help save the world from the mess we’ve put it in. I’m forced to disagree with Uncle Bill on this one, for the same reason that I critique Christians misusing scripture to disprove science: science and religion operate in different academic schools, period. “God created the world out of love and created humanity on purpose and for a purpose” is a theological claim. “Our galaxy came to formation with the collision of subatomic particles 4.5 billion years ago, and all of life came to existence from one single-celled organism and billions of years of evolution” is a (long) scientific claim. Theological claims and scientific claims cannot, by definition, contradict one another. They operate on different playing fields. Science cannot say, even if some have tried, that God does not exist. God is not an observable fact, making God nonscientific. By the same token, Christians cannot use scientific proofs or data to show that God exists. It doesn’t work that way. So why then, I ask, is science and religion always battling? I hope that this post, whether or not you agree with it, causes some thought. This is a war we all need to stop fighting, because it imply cannot be won. If we as Christians would withdraw from the fight and say, “You make your claims and we’ll make ours”, and realize that one can believe in evolution and the Big Bang and still love Jesus and be true to the Bible, I imagine that science would lay down their arms as well. And, if they didn’t, then we ought to thank God for the opportunity to put into practice “turning the other cheek”. So there. I’ve outed myself. I believe in science, and I believe in Jesus. And I believe that God is big enough to encompass the truths of both scientific and theological claims, as long as they are true, and I think it does no damage to the Truth of the Bible… so long as we learn to read that Truth as it was originally intended and not with the wrong eyes. Kevin, Reconciliation between religion and science is not even the issue! The problem is that SCIENCE disproves evolution! Evolution cannot be observed, and all observable science to date supports the biblical creation story. I have seen with my own eyes fossils which cross strata layers (Bill Nye claimed multiple times that these don’t exist) and man made tools have been found encased in rock layers that are said to be millions of years old and modern human footprints have been found embeded in dinosour footprints! All these things disprove the evolutionary timeline but “Uncle Bill” and other anti-creationists lie and deny to maintain the false worldview they have built. The earth may be older than 6000yrs, but the evolutionist concept is not SCIENTIFICALLY viable. We can observe ecosystems and see that (for example) if bees are removed, the plants fail to pollinate and the system collapses. The observable ecosystem could only work if it was initiated all at once, or at least rapidly (e.g. 6 days). The earths granite rocks show SCIENTIFICALLY through radioactive decay rings that it was all formed in milliseconds! You can find this info if you don’t take Bill Nye’s lies or ignorance for truth and go look it up! Ken Ham and others have done so, myself included. Unfortunately I’m having trouble believing you, for a couple of reasons. First, if this were true, why didn’t Ken Ham bring it up at the debate last night? Bill challenged him multiple times to show any evidence of this “swimming”, and Ken Ham was silent. He had a worldwide spotlight, and had the opportunity to say, “Yes, we have these ones, which Tim Teale has seen!” Since he did not do this, I am forced to believe that you are mistaken. Secondly, I just don’t see a motive for all these scientists to bury evidence. I don’t know how much time you spend with non-Christians, but they don’t tend to be so aggressive in their atheism. I find it hard to believe that there is a worldwide conspiracy to bury evidence. What’s the motive for this action? Bill Nye made it clear throughout the debate that what changes the minds of the scientific community is new evidence. The scientific community clamors for new discoveries that force them to learn and reconsider. Science, by its very nature, is a system open to new learning and correction. Sadly, I cannot say the same thing about most manifestations of religion. Good stuff, Kevin. And thanks for posting the video. I hadn’t seen it. As long as science is taken seriously, and as long as the idea God is Creator is taken seriously, we’ll continue to have to work to bring these ideas together in a plausible way. I think you’re pointing toward this insight. Jacob, I am going to be honest with you buddy, I am getting sleepy. I think this is my last post. I am sorry if I got a little salty up there a few comments back. One of the current inconsistencies between what I believe and how I actually engage the world is that while I admonish humility as a virtue, I am often very arrogant, especially when it comes to philosophy. I really have enjoyed this discussion even if it did result in something of an impasse. I believe in the existence of things (like all my other beliefs) based on consistency. Like I was saying earlier. I believe my keyboard exists because I feel it with my finger and see it with my eyes. I have another belief that my senses accurately portray reality.Now, this belief about my senses is at its root, an assumption. There is no way of fact checking whether or not the way the keyboard appears to me is the same as it would appear to you or that it is in fact the way my keyboard really is. That is an assumption I make. Now you have actually stumbled upon a really interesting epistemology question. What makes one belief stronger than the other? That’s really good. I think my answer would have to go something like this: My stronger belief is the one that has the most other beliefs dependent upon it. For example, I believe that the future behaves like the past. Now. Were I to remove this belief irrevocable damage would be done to almost all of my other beliefs. Thus, I would say it is very strong. Now. I have another belief. I belief that I my ipod is in my room. Should this belief turn out to be false. I would be upset. I would probably be unnerved. I would have to question whether or not my memory was accurate and so on and so on. But aside from that, it would only marginally affect my other beliefs or my view of the world. Thus, It is a weaker belief than my first belief. To answer your question directly. No my belief in God is not as strong as my belief in my key board, Or at least I don’t think it is. Should my belief in my keyboard turn out to be false, it would mean that the external world is not as it appears to my senses. In fact the external world would be radically different from my senses. This would change the majority of my other beliefs including my beliefs in science. Am I getting closer at answering your question? I believe in things (on my best days) that are consistent with my other beliefs about the world. Now my beliefs about the world include philosophical beliefs (beliefs regarding logic, epistemology, metaphysics, etc.) Scientific beliefs (beliefs about the physical world around us that have been observed and tested by experts in their fields) theological beliefs (beliefs about the nature of God and His/Her relation to the created order) Ethical beliefs (beliefs about how people ought to act) combined with many other categories of belief. Occasionally, I am led to adopt new beliefs. This sometimes happens because I read some philosophical or scientific journal which presents a hitherto unconsidered idea. I then ask myself (briefly) Do I believe this? In asking this I am really asking myself, Is this consistent with my other believes about the world? Or Would it make better sense of phenomena beliefs than my current belief? If it does, I say I believe it. If it doesn’t I say it don’t believe it. No, no, no. That wasn’t my question. I asked what makes you believe in the actual existence of something – not your philosophical views on things. Are you implying that you have just as much evidence – or rather lack thereof – for the existence of God as you do in the existence of the keyboard on which you’re typing? I was pointing out that there are some “how questions” that science can’t explain either. The question “why” is notoriously difficult. Because, as Aristotle pointed out some 2400 years ago, the question why is actually 4 questions. One of which, is how. So how and why are not easily parced out in everyday language. I also think you may fundamentally misunderstand what it is that theology, and potentially metaphysics, does. Theology and Metaphysics are after consistency. That is, how can create a noetic structure of beliefs that is internally consistent, if externally unjustifiable. There are certain beliefs that we have that are not scientifically justifiable, yet we believe them anyway in order to makes sense of our experience and our other beliefs. Take for example one unscientific belief that science itself requires to do science. That is the belief that “the future will behave like the past” We all make this assumption everyday when we get up. We don’t question whether or not we are waking up on the same planet or whether or not we will still have same body. “I had this body yesterday. The future behaves like the past, so I will have this body today.” I was living on Earth when i went to bed. The future behaves like the past, so I will be on earth today.” We would all affirm these syllogisms in spite of the fact that we cannot offer a shred of scientific evidence to justify our belief that the future will be like the past. We assume to make sense of the way we live our life and the other beliefs we have about the world. The belief in God is similarly unjustifiable. There is no knock down proof I can offer for my belief. But I believe other things that seem to imply a God. I believe that human beings have implicit value and should be treated with respect. I believe that the universe exhibits order and structure that seem to good to have just happened. I believe that there are such things as evil actions and good actions and that the evilness and goodness are real categories independent of my subjective feelings. Do any of these things prove God exists? No. Of course not. But Belief in God is more consistent with these beliefs than disbelief in God. Because I believe these other things, God seems intuitively appealing. I can’t prove God exists. No one can. But then again, no one can offer proofs for all of there beliefs. Science can’t even prove the basic premises it requires to operate. But we believe the future will behave like the past because we have evidence it does. How is that in any way “unjustifiable proof?” All of the things you list that “imply a god” can be explained by science. We humans know to respect one another, otherwise we would not have survived as a species. Evil things hurt people; doing “morally” good things usually benefits us. I don’t see what you mean by “… no one can offer proofs for all of their beliefs.” I believe in things than can be proven to exists. Theists obviously believe in things that can’t be proven to exist. What is something I believe in that has no evidence of existence? No. You don’t have evidence that the future will behave like the past. What you have is past futures which were like past pasts. And then you ASSUME that this pattern will hold for the future. But this is begging the questions. You are essentially saying “because inductive reasoning has been reliable in the past I induce it will be reliable in the future. That’s circular. You are using inductive reasoning to infer inductive reasoning. I affirming an age old philosophical problem. Solipsism. And what it basically says that in any form of argumentation you are going to rest on some assumptions that are always going to be just that, assumptions. You can no more prove the future behaves like the past than you can prove there are other minds independent of your own. The point is humility. And hopefully, it helps people realize that it is okay to not be able to prove all of their beliefs. It also shifts the emphasis in epistemology. It moves from external verification to consistency. I have evidence of minds other than my own working and creating right in front of me. Your solipsist question isn’t practical. The minds may or may not be right in front of you. You have only experienced the ideas in you own mind and ASSUMED they refer to “other minds” somewhere out in the real world. The point is not whether or not it is practical. The point is what constitutes a justified belief. You say Christian beliefs are inferior because they are not based on evidence. I have just given you two beliefs you hold that are also not based on evidence. But will you admit that there is intrinsic evidence of some things like other people’s existence, and there is no intrinsic evidence of the Flying Spaghetti Monster? I mean, please, for the sake of all humanity, admit that you don’t really believe your mind is the only thing that exists. Will you at least say there is more evidence for the law of gravity than the existence of the Flying Spaghetti Monster? What the hell is intrinsic evidence? I think you made that up. I will say that the law of gravity is more consistent with my past experience, and my other beliefs concerning the world, than belief in a flying spaghetti monster. I would say that the idea of a flying spaghetti monster is inconsistent with my beliefs about the nature of spaghetti and thus I do not believe in said creature. This is precisely the problem with religion: it teaches people to be satisfied with not understanding the world. My question is where do you personally draw the line between: what exists because of evidence, and what doesn’t exist. “Your problem is you think there is this thing called ‘proof.’ It doesn’t exist.” You are one far-fetched fellow. Your logic is so flawed… I take that back: there isn’t an ounce of logic to this statement. It’s devoid and exempt from logic. II fear you may have misunderstood me. When i say there is no such thing as proof I am saying that there is no way of fact checking our sense perception, or escaping our own perception to verify that how something appears to us is how it really is. there is no proof in that there is no way of absolutely knowing beyond a shadow of a doubt that something does or does not exist. (I would probably make room here for the cogito as a potential for one belief that we can know absolutely). What you mean by proof is consistency, That’s all I am trying to show you. As far as my logic goes. You may be right. I am largely writing extemporaneously and it is quite possible that I made a mistake. But I am normally pretty good at logic. The beauty with logic is that if I have made a logical mistake you should be able to show me it right? I agree with your point that religion and science operate on different playing fields: I don’t think there is any way of proving or disproving whether or not a god exists – the idea of god is naturally exempt from scientific explanation. Although, in my opinion, the idea of god is unnecessary in explaining how we are here – that is precisely what science is for. But I think Bill Nye’s point was something like: “Kids shouldn’t be taught that evolution and other scientific theories are false, no matter what their parents’ views on a god are.” I agree with this 100%. Wouldn’t you? “The idea of god is unnecessary in explaining how we are here”. I think some would argue a classic “unmoved mover”, “everything has an origin” position to this, but I’m okay with it. I think that essentially, people don’t need God to answer questions of “how”, but to answer questions of “why”. Science can’t tell us “why” we exist, or even suggest that there is a reason at all. I would agree with your assessment on Bill Nye’s point, and on the point itself. I think kids should be taught the scientific theories regardless of religion. This is the danger of trying to make them teach creationism too: it makes the students choose! But it’s a false choice. So I’m not understanding how you disagree with Bill Nye at all. I believe everyone should obviously have the freedom to say and believe whatever they want. But the question in whether it’s smart or socially profitable. So are you agreeing or disagreeing with Bill Nye’s belief that teaching children creationism – or rather that evolution is false? Because I think Nye’s only point was that teaching kids evolution is false is not acceptable. Yeah I understand what you’re saying. My initial disagreement with Bill was that I thought he was saying that creationism and evolution were not compatible. It was pointed out to me in another comment that he isn’t necessarily saying that, and since the video, he has clarified his position that he isn’t discounting religion at all, only those religious positions that teach against evolution. I’ve considered typing an addendum or update to this post in light of that, but I don’t really know how I want to go about that. I may have to disagree with you as to whether or not “how we are here” is a scientific question. First. When you say “how we are here” I take it you mean “how the universe as a whole is here.” The question of how we (homo sapien mammals) are here is indeed a scientific question. But the question of “how the universe is here” perhaps more famously phrased as “why is there something rather than not” is not a scientific question. To explicate why the one is scientific while the other is not, we best put forward a list of criteria by which we can demarcate what is scientific and what is not. One important criteria, I believe, is that of observation. Science is observable. It operates off of observable data and observable experiments with observable results. Once the scientist has such data it produces a theory or postulate. This theory or postulate should be able to do two things. It must make sense of current data, and (and this is the really important bit) it must make predictions as to what we should expect to see in the future. That bit about the future is what makes science reliable. If a theory can predict future phenomena it survives; if it cannot, it is replaced by one that can. Now. Is the question as to “why is there something rather than not” observable? Do we have any sense data or phenomena from outside of the universe? No we do not. In fact, the problem is worse. Not only do we not have date from beyond our universe, it appears we cannot have such information. The question of “why is there something rather than not” is not scientific, it is metaphysical. Thus it is the realm of philosophy and theology. True, many scientists will put forth theories or hypotheses as to the reason the universe is here rather than not, but if they are honest, they will admit that they are proffering philosophical arguments, not scientific ones. Science has never claimed to explain the “why are we here” question. Science does its best in explaining not only how humans got here, but how the universe came into being. As for the question of “why is there something as opposed to nothing” – do you really expect human beings on this one single planet in this one little galaxy in an ever-expanding universe to objectively know the answer to this question this early on in the history of humans? The idea of god does no better in explaining the “whys.” It just raises the same metaphysical questions like, “Why did God even create the universe?” or, “What came before God 14.7 years ago – when he decided to initiate the big bang?” The idea of a god doesn’t simplify these metaphysical questions. You don’t get answers to any important questions by simplifying them. Evolution and Big Bang aren’t simple answers to scientific questions, neither are Christian assertions aren’t simple answers to metaphysical questions. But scientific theories try to objectively explain scientific questions with evidence. Christian assertions are mere claims of metaphysical answers with absolutely no prior evidence. I never once claimed God is the only explanation to the question of why is there something rather than not.. In fact, I never mentioned God at all. II also never said I expected anything of humans at all. I was merely putting some limitations on what types of questions science can answer. And I said that science can answer one sense of the question “how are we here” but there are other possible meanings implied by that question. One being “how are we here” as in “how is it that there is this thing called Earth orbiting this other thing called the sun in this one big thing called the universe?” push that question far enough and you will arrive at “why is there something rather than nothing. Science cannot answer that question. That is all I said. Again. I never claimed was a catchall answer to these questions. I simply said science could not answer that question. My point was: no, science can’t explain why we are here, but it doesn’t claim to have the answers. The idea of a god is saying we have the answers as to why and how we are here, without scientific explanation. Am I the only one here who thought this post was complete trash? Come on, do you really think it is possible that we all came from some lightening struck goop some hundred billion years ago? What about the uncontrovertable evidence for Noah’s flood? Did you know that Charles Darwin was an opium addict who published “Origins” as a way to feed his habit? It’s time that Christians stand up for truth regardless of what any chic-fil-a hating hippies think about us. No one is with you, you sad sack of human being. Overall a great post. Good fair discussion as always. I also always appreciate a good informational comparison chart. My most immediate life changing realization however was the fact that I do not currently follow Conan on twitter. Don’t worry though I fixed the problem. Very well done, Kevin. If the church had said in the 1800’s, “Thanks, Mr. Darwin. Isn’t it wonderful how God creates?”, then the argument would have been over before it started, and we would have won. Agreed, Steve! We weren’t around back then, and I don’t know enough about church history, but it would be interesting to know who fired first. At the same time, I don’t think the church at the time had the same tools and means of biblical study that we do today, like literary or redaction criticism. So I don’t think I can really blame them too harshly even though I want to. Blaming them for not interpreting that scripture literally is like blaming Genesis for not knowing about evolution. But today, we have an opportunity to learn from their mistakes, which I think makes us more accountable to them. In a way, it could be said that Darwin fired first. Before all of his work on “The Origin of Species”, Darwin was a Christian. It wasn’t until after his reading of “Principles of Geology” that he developed the false dichotomy at hand (his fundamentalist understanding of the Bible of course preceded this). As a result, he discarded the faith which then gave birth to the present day model “How-to-debunk-a-Christian-(as long as he/she has an inadequate understanding of the Bible)”. I think some wish to disprove the Biblical account in order to discredit the entire Bible. That way, there is no reason to believe any of it, nor to have a moral accountability for its commands. This is definitely possible, but I think it’s our responsibility to make sure those two aren’t inextricably linked. Herschel said this really well in his comment. If people are told that they have to accept a 6-day creation in order to follow the Bible, the moment they see evidence for evolution, the whole Bible goes out the window. I imagine we lose a lot of followers that way. I think it is possible to interpret yom” as an indefinite period, which allows for the possibility of geological eras. However, we cannot discount the supernatural. Simply because we don’t experience the supernatural today, doesn’t prove that God did not exercise His supernatural power in the past. He could have created everything in 7 24 hour days, if He desired. Or taken eons, if He chose. We must realize that the primary tool used by scientific research is that of observable repetition. Neither evolution or creation can be exactly duplicated and thus observed. Therefore, both evolution and creationism require faith; the question is, what is your faith in? Happenstance and coincidence? Or a Divine, loving Creator? The Bible isn’t intended to be a science textbook, but rather a revelation of God to man concerning why he (man) exists and how he (man) can be restored to right relationship with the Creator. Those who wish to discover that realtionship can do so, and those who wish to choose thier own path have a similar freedom. One day, all will be accountible for thier choices. I think it’s certainly important to maintain a belief in the supernatural regarding God, especially since Resurrection is such a fundamental tenant. And between those, I have to choose the first. The second does not sit well with the image of God in scripture. Moral accountability for its commands? Just because one doesn’t believe in what the Bible preaches doesn’t in any way mean he or she has no “moral accountability.” True, atheists don’t have an absolute set of morals (i.e., a religious or sacred text) off of which to base going about morality. But that is in no way suggestive that atheists have no morals. We just have to find them out ourselves instead of them being fed to us through a single book. I didn’t say those who reject the Bible have no morals (though I wonder what standard they will use, since “morality” is a Biblical concept). I said they delude themselves into believiing that they are not accountible for the moral commands of scripture. of course, I believe in free will, no thye can reject those moral standards, if they choose. I just believe to do so will result in eternal and cataclysmic consequences. I don’t think morality is an exclusively Biblical concept. That’s a little strong. If not the Bible, from where do we get a moral standard? Tradition? Personal choice? Relativity? Most sources deal with legal obligation, faced with potential consequences for disobedience. The Bible speaks of obedience in terms of chossing right instead of wrong. To me, that’s a moral code. I think you may have missed his point entirely. He did not say that you would have no “morals”, nor did her say you would have no “moral accountability” he said you would have no “moral accountability for its commands.” Which (though it could probably be worded better) could be taken to mean that if one did not take the Bible as the revelation of God’s self to man, one would not need to hold him/herself accountable to the moral principles in that revelation, because you would not likely take the Bible as authoritative. That is probably true. You claim that you can have your own morals. That is probably true. But unless you happened to “find” the exact same morals that the Bible commands, you would not likely find yourself morally accountable to those Biblical commands. You’ve gone and muddled the whole point, kind sir. I’m sorry for misunderstanding the initial statement. True, my morals don’t parallel those of the Bible. Nevertheless I do have morals and I do believe morals are important. I believe morals have been instilled in us through evolution and plain old reason. Well written and organized. Would only argue the point, that if the church backed off, science would. The church has not spent multiple billiions trying to build a super collider to prove there is a God. Science, being science has no choice but to disprove creation and the existence of God. I think the controversy around the “God Particle” was more media driven than anything. I didn’t hear any of the scientists saying they were disproving God. The motivation was to put observable science behind theoretical science and see if the two matched up regarding the Big Bang Theory. And, it did. The easy theological response? That super collider you built to make those things hit together exactly how you want them to? We call that God. Very good post brother! I felt that it flowed especially well and if I didn’t know you, I might think you to be one of those bloggers that everybody reads…and hopefully for their sake that will one day be true. As far as the meat and potatoes of this post, very good points and you laid out the root of the problem clearly by expressing that the two realms do not have the ability to contradict each other. I feel like this is at the very heart of issues surrounding how we view scriptural authority which you know is something that our generation, and myself in particular, really wrestle with. The loudest voice in the evangelical church today is that of the fundamentalist, not because they have something new to say but because they are threatened by ideas that run contrary to their dogmatic set of core values and beliefs. It seems that the more we express a willingness to engage scripture and put all claims to the test in order to see the truth rise to the top, the more those who are close-minded raise their voices and shout “heretic” in a sort of witch hunt manner that doesn’t seek to redeem or restore those they oppose (in this case us) back to the Body. To you and I the things you have expressed just make sense, that truth about God can be revealed through a number of avenues. Obviously the way we engage scripture goes back to the cultural linguistic model that Green taught us and through that lens we can understand that scripture presents truths about God, only those truths were not understood the same way (and perhaps not as clearly due to their lack of scientific understanding). The question I really have for fundamentalists (and I should clarify that I don’t hate them) is as to how they might handle the acceptance of the reality that there are plenty of passages of scripture that can easily be refuted if we view them simply as propositional statements. Just because the sun doesn’t revolved around the earth, does it take away from who God is? If the earth isn’t only a few thousand years old as geology seems to suggest, does it take away from what Christ did for us? If I must question the scientific or moral integrity of some passages of scripture, must I be skeptical of them all? The sad reality is that for many this is the case. I liked the demonstration you made to distinguish between theological claims and scientific claims and I thought it was interesting that I could easily blend the two statements without any conflict. The Bible gives us the what but science is helping to explain some of the how. Now granted there are things we’ll never be able to scientifically explain or bring any more understanding to, particularly in understanding the death and resurrection, but in a lot of cases I think our scientific understanding does a good job helping us filter, and grow to appreciate the Bible even more. Well said, Nye. You constructed your point very well. I especially liked the way you addressed our previous mistakes in dealing with scientific findings and used that example as a springboard into the clear literary moves being made in Genesis. No disagreements from me. I will say that I’ve been fascinated by the way some Christians approach this topic on the terms of the opposition. Which is to say that upon examining the origin of this discussion, we find that non-Christians are telling Christians what the Bible is intending to say, Christians are accepting the opposition’s dichotomic understanding of the situation, and Christians then feel they must strongly appose this understanding in order for their beliefs to remain valid. They therefore reject the whole evolutionary system and label it “non-Christian”. When in actuality, the thing that Christians should be rejecting is the non-Christian’s shallow understanding of what the Bible is and what it intends to do. The notion that, “If ‘A’ (evolution makes sense and is in all its parts verifiably testable) then ‘B’ (your Bible is false)” needs to be deconstructed and destroyed from the get-go. The Bible is beautifully more complex than many of us could’ve hoped. Anywhosal… thanks for the thought provoking post. Great thoughts. However, I think that the vast majority of the general population misunderstands his statement about not teaching children Creationism. He is not, at least in this video, saying that we should not understand God to have created through natural processes. Nothing in that statement goes against the basic principles of science. He is referring to Creationism that teaches a literal young earth interpretation of Genesis 1 and 2, that many people try to force into the classroom as hard science. Thanks for commenting, Michael. You may be right about what he meant. Perhaps he meant specifically in schools, which I would also agree with. I think I was pulling more from his tone than anything else, which is never really fair to do. Good point.